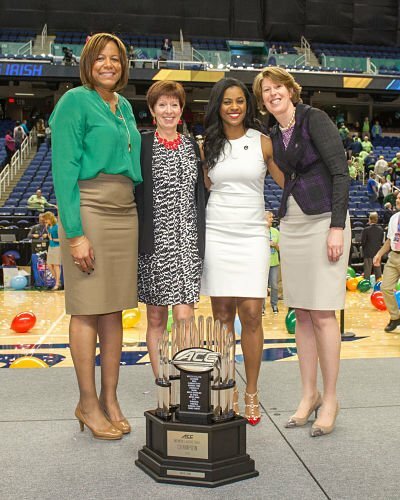 Notre Dame coach Muffet McGraw, second from left, with associate head coach Carol Owens and associate coaches Niele Ivey and Beth Cunningham. McGraw has had an all-female coaching staff since 2012. Photo by Mike Bennett. It has become a well-known fact – and recently, a topic of conversation – that the overall percentage of female coaches in the NCAA ranks has declined since the passage of Title IX in 1972. Then, 90 percent of the coaches of women’s teams were female, but today, that number hovers around 43 percent. What isn’t as known is that this apparent drop hasn’t affected women’s basketball as much. In fact, the overall majority of coaches combined in all three divisions of the sport are women, with only Division II having a slight majority of male coaches. Though this puts basketball in good standing compared with many other women’s sports, the same high percentages don’t seem to exist at the assistant coach level, and they sure don’t within the athletics director ranks. A number of female assistant basketball coaches worry about future opportunities, and there is resentment that male coaches have dual career options while women have only one. Maintaining work-life balance also makes coaching parity more complex for women. However, the Women’s Basketball Coaches Association (WBCA) has several coaching development programs in the works to bolster career possibilities for women. Leaders in the sport say the future for female coaches is bright – if they keep fighting. NCAA statistics through the 2014-2015 season show that the number of female head basketball coaches in all three Divisions was 57 percent, while male head coaches numbered 43 percent. The highest percentage of female head coaches was in Division III, where 61 percent were women. Division I female coaches numbered 59 percent, and in Division II, 52 percent of head coaches were men. This gives women’s basketball a “B” grade among collegiate women’s sports, according to a 2016 study, “Head Coaches of Women’s Collegiate Teams,” from the Tucker Center for Research on Girls and Women in Sport at the University of Minnesota, and the Alliance of Women Coaches. Gymnastics also earned a B grade, while field hockey, golf, lacrosse, equestrian and softball all received an A grade for having the highest percentage of female coaches. Heading the top of the “C” grade list was Nordic skiing, with a 50-50 female-male head coaching rate. All other women’s sports are mostly coached by men (Table 3). Why is women’s basketball one of the few college sports left that has a female head coaching majority? No one can say for sure. The NCAA doesn’t keep data on the gender breakdown of associate head and assistant basketball coaches. But a 2013 Tucker Center study, “The Decline of Women Coaches in Collegiate Athletics,” found that the number of female assistant coaches in all sports is only slightly better than the number of women head coaches in six major conferences – around 44 percent (Table B). Conversely, 70 percent of those holding director of operations positions and 68 percent of graduate assistants are women, marking a break in the coaching ladder that is supposed to lead to the top. Anucha Browne, the NCAA’s vice president of women’s basketball championships, said it is a significant issue that is on the radar of stakeholders. Kathie DeBoer, the executive director of the American Volleyball Coaches Association, sees a similar lack of women coaches in her sport. 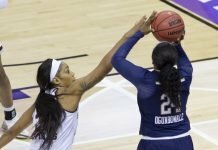 She disputes the 90-43 percent drop because colleges typically had three sports at most when Title IX was enacted. “Ninety percent of zero is zero,” DeBoer said. Men began coaching women’s sports, she said, when they became lucrative. Less women in coaching and so few female athletic directors is discouraging to numerous assistant coaches. Many despair because of what they see as less-qualified men getting jobs over women. Browne sees it too. “Men get more opportunities than women, even if they’re not qualified,” she said. 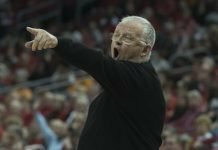 One recent hire that seems to have drawn resentment from assistant coaches around the country is Santa Clara athletic director Renee Baumgartner’s appointment of Bill Carr to be the head coach of women’s basketball. Baumgartner is one of only a handful of Division I female athletic directors in the country, and Carr has coached basketball for 25 years, but has never coached women. A Santa Clara spokesman said both Baumgartner and women’s basketball administrator Staci Gustafson felt Carr was the most qualified applicant for the position. Coaches are afraid to speak on the record about what they call disillusionment and fear that their coaching jobs, as women, are threatened, for fear of retaliation. Ackerman taps into the probable reasons behind the industry-wide anger and unease among female coaches. Ackerman said the only question she had when former WNBA guard Becky Hammon was hired as San Antonio Spurs assistant coach last year was why it took so long for women to break that barrier in the NBA. Browne said every level of sports needs more women in it. “We do need to see more women in the coaching pipeline, and it’s also important to see female officials in the game as well as women in influential positions in athletic administrations,” she said. One reason there is a gap between entry-level basketball staff jobs, assistant coach positions and head coaching appointments may be that women sometimes have conflicting demands in their work and personal lives. Browne and others say that sometimes women leave coaching when they have trouble balancing coaching duties with family responsibilities. Ackerman said that conflict played a role in her leaving the professional basketball ranks. In the Tucker Center’s 2012 study, “Barriers and supports for female coaches: an ecological model,” the most common barrier cited by female coaches across all levels was balancing work and family. It is a blockade that seems to effect assistant coaches in particular, as a look around the women’s basketball community sees few assistants with children. Georgia coach Joni Taylor has noticed that trend. “It is harder for female assistant coaches at certain high-level programs to manage having a family and children,” Taylor said. 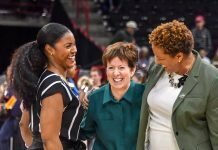 Notre Dame coach Muffet McGraw also acknowledged that it is “harder for assistants to have a family” than it might be for head coaches. But two of her assistant coaches do have children. The work-life balance is an issue that women will have to negotiate if they hope to take professional steps forward, according to DeBoer. There is a lot of specialized training now available, however, through the WBCA. Executive Director Danielle Donahew said the organization did quite a bit of research the past few years in preparing to offer more professional development for coaches. Their findings shaped the steps that they took to build new programs. One of the WBCA’s staples is the “So You Want to Be a Coach” program, which targets graduating college seniors who think they want to enter the coaching profession. Interning with coaches, administrators and media members gives participants what Donahew called “an immersion experience” into the profession. A new endeavor this year is the expanded Center for Coaching Excellence, which aims to teach coaches the business side of the profession. Before it was limited to head coaches, but now includes assistants as well. There is a teaching session in June and one in August. The Marines Leadership Workshop is for assistant coaches, who are taken through team and leadership-building activities using the principles of the Marines. The last new WBCA offering is a coach-to-coach mentoring program, which was the brain child of Penn State coach Coquese Washington. Donahew said a pilot program recently run was successful, which enabled them to come up with a model. Browne said the NCAA is keeping an eye on the WBCA’s new professional development endeavors, and plans to work with them on it. “We are focused on keeping women in the coaching pipeline,” Browne said. Stanford assistant coach Kate Paye, head coach Tara VanDerveer, associate head coach Amy Tucker, and assistant coach Tempie Brown. 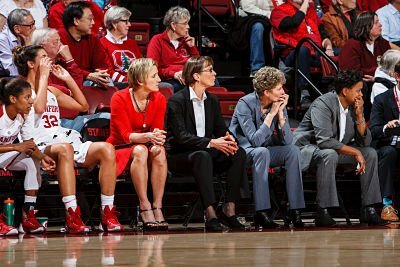 VanDerveer’s coaching staff has been all women in her 30 years as Cardinal head coach. Photo Stanfordphoto.com. The final piece of the puzzle in seeing more female coaches in the college ranks is that women need to hire women, and women need to apply for coaching jobs. McGraw has had an all-female staff since 2012, and said she is enjoying it. At the same time, McGraw sees too many potentially great coaches holding back. McGraw said women also need to watch out for themselves more. In more than 30 years as Stanford’s head coach, Tara VanDerveer has had only female assistant coaches. They have been women she knew, and who were recommended to her for their coaching skills. VanDerveer said she believes it is important to give women an opportunity to coach and mentor other women. Is it Nov. 6 yet?